Fantasy Football, NFL Draft and NFL blog for Eat, Drink and Sleep Football. Week 11 was not pretty, as injuries and poor performances widely struck the players I recommended. I am sure the same hurt many owners in a critical week. These are always tough weeks to swallow, but you have to just keep on moving forward and leave it all behind you. With two weeks left in most regular seasons, now is the time to buckle down and try to make the best decisions you can -- then pray for the best. Before we move on to Week 12, let’s review the misery of last week's results. Best of the week -- Mark Ingram +11.0: Ingram largely struggled on the ground against an underwhelming Bengals run defense, but made up for it by catching all seven of his targets. When Pierre Thomas returns, Ingram will have to pick up the production via the ground game to hold high value, as he will not be catching that many balls out of the backfield. Runner-up -- Matt Ryan +7.9: Ryan was not overly impressive against a porous Panthers secondary, but put up a respectable 17.8 points on the week. RG3 and Matthew Stafford both struggled in real life, but RG3 actually put together a solid fantasy day. Stafford on the other hand did not. On a completely non-fantasy related side note, this Lions offense is struggling, and the injury excuses are no longer valid with Calvin Johnson back. The O-line is beat up, but a good game plan can help mitigate that issue. There is no way a team with that much offensive talent should be as mediocre as they are (offensively, that is). Joe Lombardi comes from the Sean Peyton coaching tree, but this is a good example that the system isn’t effective without someone who knows how to call plays on game day. Worst of the week -- Alex Smith -24.7: Ugh. Not much to say other than just a poor call on my part. Dude totaled five points in a game where they scored 24 and beat the Seahawks. Runner-up -- DeSean Jackson -22: Jackson was a disappointment against what was a fantastic matchup. He was clearly impacted by RG3’s poor decision-making and inaccurate throws. But this +/- has far less to do with Jackson than it does Alshon Jeffery. To be fair, Jackson did outscore Golden Tate, who was my 2nd player to start him over. But the story was Jeffery, who put up an astonishing 30.5 points. He dismantled what had been a very good Vikings secondary to this point in the season. It’s never shocking to see a player of his talent in this offense go off. But I would be lying if I said I wasn’t mildly surprised given how poor the Bears had been playing. Let’s get this train back on track and pointed in the right direction in Week 12. Flacco has appeared multiple times in this article, with mixed success. Believe it or not, I am not a Ravens fan in any way, but he keeps coming up as an underrated option in my model, so I keep plugging him in. His opponent this week is the Saints, who are reeling right now. I mean, they just gave up 220 and 3 TDs to Andy Dalton. They are also coming off of back-to-back home losses, which is about as common as Bill Belichik smiling at a press conference. Surprisingly, they are tied for the lead in the NFC South (technically behind because of the tie-breaker) and are desperate for a win this week to right the ship. As a result, I think this game will be a tight one, but it’s not going to be the defense that gives them a chance to win. New Orleans ranks 28th in overall defensive efficiency. If they want to win, they will need to score points, and I think they will do just that. In order to keep pace, Flacco will be forced to throw a lot. Given the inadequacies in the Saints secondary (NO ranks 26th in defensive pass efficiency and FPA to QBs), he should have the opportunity to post mid-tier QB1 numbers this week. Hoyer is always a risk for a dud, but he has been a surprisingly effective fantasy QB in recent weeks. Over the past five weeks, Hoyer ranks 14th amongst all QBs in FPPG. It’s no coincidence that his uptick in production coincides with the loss of center Alex Mack, who was a key cog in the Browns effective run game. Since that point, Cleveland has struggled to run the ball consistently and has been forced to pass the ball more. But the reason he is on this week’s list is two-fold. First, the Browns get Josh Gordon back this week. I can’t even explain how big of an upgrade he is over any other receiver on the roster, this kid is obviously a stud and gives this offense a huge boost. Second, Hoyer gets one of the best receivers in the game back against one of the worst pass defenses in the league. Atlanta ranks dead last in pass defense efficiency and gives up the 10th-most fantasy points to QBs. Additionally, this game will be played in the Georgia Dome, where the Falcons offense traditionally plays much better. The Browns may have to throw a lot to keep up with the Falcons in a game that is critical to both team’s playoff chances. I like Hoyer’s chances of significantly outplaying his current ranking. Similar to the logic behind Flacco, Forsett will be a big part of what I think is going to be a high-scoring game. Forsett is handling the majority of the backfield work and doesn’t look to relinquish that role anytime soon, coming off one of his better performances this season in Week 10 (Ravens were on bye in Week 11). New Orleans struggles against the run, ranking 28th in efficiency. Additionally, they rank 30th against RBs as receivers, and Forsett is the Ravens passing-down back as well. He should get at least 12-15 carries, but I would expect a handful of receptions as well. Regardless if this is a high-scoring game or somehow turns into a grind it out affair, Forsett will be involved from the get go and has a matchup that he can exploit. Miller has a tough matchup against the Broncos this week, as they are a top-10 run defense by most measures. However, the Dolphins are one of the best run offenses in the league and utilize Miller in a variety of ways. The Dolphins don’t have the firepower to get into a shootout with the Broncos, so I expect them to lean on the run game and play ball control. Miller looked healthy last week and should be good to go for a full workload in Week 12. As a bonus, Miller is a solid receiver out of the backfield and has caught at least one pass in every game this season. However, he has caught at least two in every game that he was healthy and finished. Denver is vulnerable against RBs as receivers and that may actually represent the Dolphins best passing matchup considering the Broncos excel against defending WRs and TEs. If I did a pick of the week, or ranked my picks in order of confidence, this one would be right at the top. Floyd continues to be undervalued in the fantasy world and I don’t understand why. He may not be a high upside or exciting player, but you would be hard pressed to find someone with a more consistent floor. He has scored a minimum of eight points in every game he has played and averages 11.3 PPG. Again, not mind-blowing numbers by any means, but a guaranteed 8-12 points from your WR3 every week isn’t bad. However, as I mentioned last week, he still has some big-game ability in him. He has hit 14-plus points in three games this season including 14.4 last week. This week, Floyd gets a great matchup against the Rams, who rank dead last in pass efficiency against WR2’s. They have given up consecutive big games to Emmanuel Sanders (in three quarters), Larry Fitzgerald, and Anquan Boldin. Floyd should be next on that list. For this pick, I am loading up on players to start him over. ODB has been essentially matchup-proof since breaking onto the scene in Week 5. In two straight difficult matchups, ODB has put up over 15 points in each. This week, Beckham gets a much easier ride against the Cowboys. As impressive as the Cowboys have been on defense given their lack of talent, they have their deficiencies as well. Dallas struggles against WR2’s, ranking 31st in defensive pass efficiency against that position. Expect ODB to put up big numbers in what is nothing more than a “pride” game for the reeling Giants. Boldin is another guy who has been on this list a few times recently, and he has yet to disappoint. SF is struggling on offense, but Boldin has been their most consistent weapon and put up big numbers when the matchup is right. Well, this week the matchup is right. The Redskins are a mess in many phases, but perhaps their greatest weakness is in their pass defense. Washington ranks 29th in overall defensive pass efficiency, and specific to Boldin, 28th against WR2’s. Additionally, Washington is actually quite good against the run, ranking 11th in efficiency. As the Niners already struggle to run the ball, I expect Colin Kaepernick to air it out more than usual against this porous secondary. Ertz’s inconsistency and maddening lack of usage are well-documented. He simply isn’t utilized as he should be given his talents. But a lot of that was exacerbated when Mark Sanchez replaced Nick Foles, as Ertz was only targeted twice in Weeks 9 and 10, Sanchez’s first two games. Last week, albeit in comeback mode, Ertz saw seven targets and caught four for 55 yards. Given that Sanchez was unexpectedly thrust into the starter's role, perhaps Ertz was forgotten due to lack of familiarity with him. Sanchez was working with the 2nd team and rarely (if ever) saw a snap with Ertz. Jordan Mathews emergence could be explained the same way, as he had more familiarity with Sanchez than any other player in the starting lineup. Off an encouraging seven targets last week, I think Sanchez is getting more comfortable with the starting receiving options and we could see Ertz’s utilization increase. Given the Titans struggles against the TE position, ranking 25th in defensive pass efficiency, I think Ertz will surprise some people this week. If he is on your bench, the frustration with him may only continue. Thanks for reading and good luck in Week 12! Follow me on Twitter @rw11687. 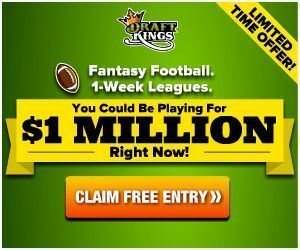 DraftKings: Open an account and get a 100% deposit bonus (up to $600). Want to win one of our site's t-shirts for free? >> Enter our free Week 13 contest. We are always looking for link exchange partners. If you have a sports site and are interested in exchanging links, e-mail me at kevin [at] eatdrinkandsleepfootball [dot] com.